Rep. Liz Cheney (R., Wyo.) had harsh words for Rep. Alexandria Ocasio-Cortez (D., NY) after she defended Rep. Ilhan Omar's (D., Minn.) comments about 9/11 and rebuked Rep. Dan Crenshaw (R., Texas), a veteran of the war in Afghanistan. "It's disgraceful. Congresswoman Ocasio-Cortez came out to defend Omar and said, well, her comments were taken out of context and that's ridiculous," Cheney said during an appearance on the Ross Kaminsky Show on Friday. "There's no context in which calling 9/11 ‘some people did something' is okay." "And I would also point out, Congresswoman Ocasio-Cortez attacked our colleague Dan Crenshaw and suggested he should go do something about domestic terrorism. And I would just remind her he lost an eye in Afghanistan defending her freedom, and I think she ought to go thank him for that," Cheney continued. "And she ought to recognize that it doesn't matter what your gender is, it doesn't matter what your race is, it doesn't matter what your religion is, if you stand up and say 9/11 was ‘some people did something', we all ought to condemn that, and especially a representative from New York." "Remember, it was the worst attack on U.S. soil in our history," Cheney added. 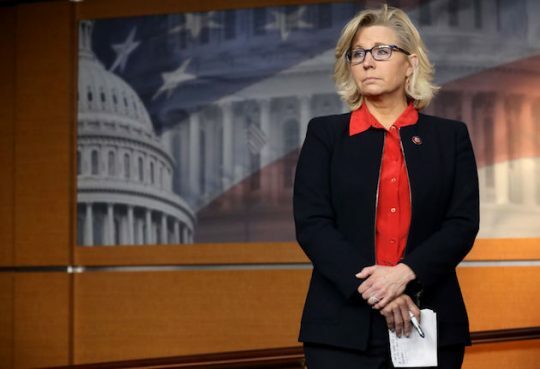 "It was at the hands of radical Islamic terrorists and anybody who holds the views that Representative Omar has expressed on this issue and on anti-Semitism has no place on the House Foreign Affairs Committee." Crenshaw criticized Omar on Twitter after she referred to the 9/11 terrorist attacks as "some people did something." Ocasio-Cortez jumped on his tweet, saying he should "go do something" about domestic terrorism. Crenshaw served in the war in Afghanistan and lost his right eye after an improvised explosive device detonated. Omar accused Crenshaw of inciting violence against her, which the Texas congressman denied. This entry was posted in Politics and tagged Alexandria Ocasio-Cortez, Dan Crenshaw, Ilhan Omar, Liz Cheney. Bookmark the permalink.